Bob and Mavis leave Saturday, August 18, 2007 on the Katy Leigh on a cruising journey to the head of navigation at mile 381.0 of the Cumberland River. The trip is expected to take about 3 weeks. We will leave Kenlake Marina and head north to the canal that connects Kentucky Lake on the Tennessee River to Barkley Lake on the Cumberland. 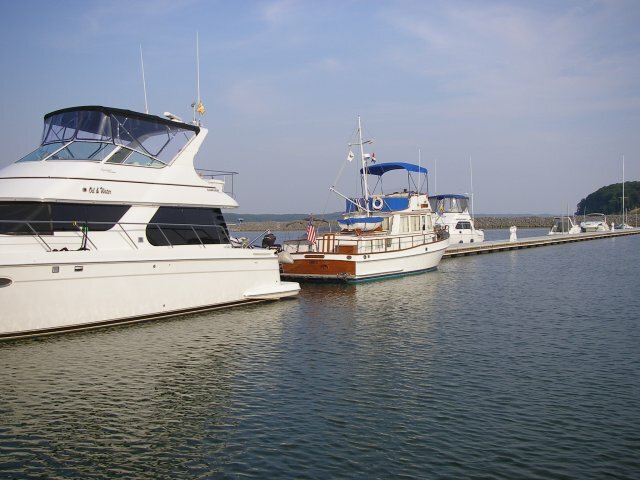 We will then head upstream to Barkley Lake State Park Marina at mile 59.1 where the Grand Lakes Yacht Club is holding a "Supper Club Afloat" at the hotel there. Sunday morning we plan to cruise to Clarksville (mile 126.1) and stay at the new dock. The photo taken in June shows the Katy Leigh on the new transient docks at Kenlake Marina behind Oil & Water, a 45 ft Carver, belonging to our friends Bob & Ginny.